Welcome to the Young Writers’ Corner! As an instructor at The Writer’s Center, one of Adele Steiner’s goals has been to provide the many talented young poets and writers who attend Center workshops with a showcase for their writing. This summer, Adele taught Poetry and Narrative Verse for Teens and we wanted to give Adele’s students the opportunity to be the first young poets and writers to contribute their work to this blog. in the wild jungle of your hair. under the spell of eternal spotless gray. to get you down on your knees. Swiftly moving against a blanket of blue skies. The tree has the power to see all, both heaven and earth. The tree, reaching for the stars that hide between the sun’s beaming rays. The tree, providing us with shelter and shade. I was weaving a crown. to touch taste, taste, smell. Today, I'd like to start by saying that this will be the last blog post for a couple weeks. I'll be off to Denmark (two days from now as I write this), and won't return until Aug. 1st. In two weeks, Adele Steiner will be a guest blogger for the whole week, and she'll have some very special guests: participants in her Poetry and Narrative Verse for Teens workshop. That means that our monthly column from Glimmer Train, Glimmer Thursday, will be postponed until August. We will rest. BUT don't forget, fall workshops are now available online, and we've got an outstanding lineup of great events. To see the full range of workshops and events, click back to our Web site. Taylor (science writing) was featured on BookTV, and you can watch it here. Piers (comic book writing) was profiled in the Washington Examiner here. Another workshop leader, Dennis Drabelle, has a new book. My interview with him is here. And he'll be reading July 15th at 6:30pm at Barnes & Noble (555 12th St. NW). And Serena over at Savvy Verse and Wit (and Examiner) wrote this nice little piece about The Writer's Center's new Undiscovered Voices program. That's what I have for now. This fall, look for more reviews here at First Person Plural and, if we can, member profiles, interviews, workshop leader discussions, and craft articles. Be in touch in August! This Sunday, July 12, from 2-4 p.m., The Writer's Center will host writers Austin Camacho, Frank S. Joseph, Angela Render, Laura Shovan, and Lynn Stearns. 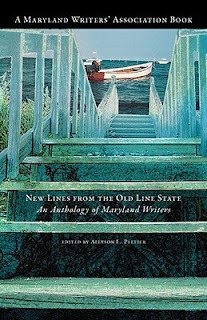 Join these Maryland writers as they read from their work in the Maryland Writers’ Association’s debut anthology, New Lines from the Old Line State. Austin Camacho is the author of five detective novels in the Hannibal Jones series - The Troubleshooter, Blood and Bone, Collateral Damage, Damaged Goods and Russian Roulette, plus two action thrillers, The Payback Assignment and The Orion Assignment. He served as president of the Maryland Writers Association and currently serves as president of the Northern Virginia chapter of the Virginia Writers Club. He also teaches writing at Anne Arundel Community College and is a public affairs specialist for the Defense Department. Frank S. Joseph got his start in journalism at the City News Bureau of Chicago and worked at The Associated Press, covering the 1968 Democratic National Convention, the Detroit riot, Dr. Martin Luther King’s march into Cicero IL, along with many other uprisings and urban violence prevalent in the mid-‘60s in Chicago. Frank then became an editor with the Washington Post during the Watergate years and later turned to publishing. His first novel, To Love Mercy, published in 2006, has won six awards. Angela Render has been designing and maintaining web sites for over a decade. She was the Web Editorial Assistant and then the Web Developer for Smithsonian Magazine for four years. Her first novel, Forged by Lightning: A Novel of Hannibal and Scipio, was published in 2006. She currently has a column called Computer Business in the Writers' Journal. She leads workshops about blogging and marketing at The Writer's Center, including some workshops this month. Laura Shovan has published her poetry in Lips, The Jewish Women’s Literary Annual, the Paterson Literary Review, the Global City Review, The Little Patuxent Review, Poets Online, and an upcoming anthology – Words & Images of Belonging. Also a teacher, Laura has also combined her interest in poetry with her love of children. She has conducted poetry workshops for children in conjunction with the Maryland State Arts Council and has also taught journalism for children. She also freelances for local publications, such as the Baltimore Sun, Baltimore Magazine and Baltimore’s Child. Lynn Stearns currently serves as the associate fiction editor for the Potomac Review. Her work has appeared in the Bitter Oleander, descant, Haight-Ashbury Review, Troika, Wascana Review, and other publications. She has received awards for short stories, narratives, and poetry from Mentor, the National League of American Pen Women, Random House, among others. Lynn will lead a workshop on writing memoirs at The Writer's Center this fall. For more information on the Maryland Writer's Association and New Lines from the Old Line State, click here. As far as Disney films go, The Lion King is my favorite, all hands down. And, apparently, I’m not alone in liking this film. In 1994, it was the top grossing film of the year, earning more than $173 million dollars; Forrest Gump came in second. It’s been recorded as the highest-grossing animated film up until that year. What made this film such a sensation? Perhaps it was the universal themes of betrayal, legacy, and coming-of-age that resonated with its audience. Or that it appealed to lovers of Shakespeare (think Hamlet). Or that it had an all-star cast lending their voice to the cartoons (Jonathan Taylor Thomas, Mathew Broderic, James Earl Jones, and Whoopi Goldberg) and its music created by the inimitable Sir Elton John. Now that I think of it. . . there was something else that made this film exciting, new, and different. It wasn’t set in the deserts of Arabia where we meet Aladdin or an enchanted fortress where we meet Snow White. Rather, it was set in Africa, a place where Disney or any pop culture medium hadn’t gone until then. It was really something. For the duration of the film at least, I forgot all of the negative hype about Africa. It was no longer a “Dark Continent” where nightmares swirled like a Van Gough painting. 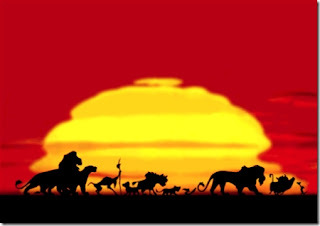 I would imagine myself there—dancing, singing hakuna matata, growing up to join the nobility. And how I loved to say "Mufasa, ooo say it again" that memorable line from one of the hyena’s that Whoopi Goldberg voiced for. To think my world could be shook by one little Disney film about Africa. And that was almost sixteen years ago. Dennis Drabelle, a contributing editor of The Washington Post Book World since 1985, ocassionally leads workshops in book reviewing at The Writer's Center. 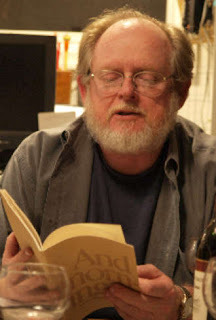 He has written for The Atlantic Monthly, GQ, Film Comment, Civilization, and Smithsonian as critic, and contributed to such magazines as Wilderness, Backpacker, and Outside. He worked for 6 years as a lawyer at the U.S. Interior Department where his responsibilities included monitoring the effects of the 1872 Mining Law on national parks and wilderness areas. In 1996 he was awarded the National Book Critics Circle's award for excellence in reviewing. Though he lives in D.C. now, he's a native Missourian. Like me, he's a die-hard fan of the world's greatest baseball team--a team that hails from his home state (and is NOT named the Royals). 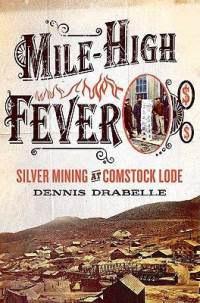 Today marks the publication of his terrific new book, Mile-High Fever: Silver Mines, Boom Towns, and High Living on the Comstock Lode. He'll be reading/signing from the book soon (July 15) at the Barnes & Noble at 555 12th St. N.W., at 6:30 p.m. Complete book info here. To give blog readers a foretaste of the book, I asked Dennis a few questions. If you'd like to read a full review of Mile-High Fever, click here. Or, to read a Washington Post review from Sunday, click here. It would seem that you “began” writing this book in the early 1970s, when you worked as a lawyer on mining issues for the Department of the Interior. What about the Comstock so enthralled you that you returned to it three decades later? Well, I became familiar with mining and other public-lands issues in the ’70s, but I didn’t start thinking about the Comstock until about nine years ago, when I was rereading Anthony Trollope’s superb novel of the Gilded Age, The Way We Live Now. There is an episode in the novel where American shysters travel to London and peddle wildcat mining stocks to poor, unsuspecting Brits. After finishing it, I read the entry on the novel in The Penguin Companion to Trollope, which said that the episode was probably based on the Emma Mine scandal. I researched that and found that a U.S. senator, William Stewart, was one of the main instigators—and that he’d first made a name for himself as a lawyer on the Comstock Lode. I wrote an article about him and kept reading about the Comstock, and soon I began to think there might be a book in it. Many readers, I imagine, may not be familiar with the Comstock Lode and what it meant to the development of the United States. Do you see this book as a way to educate Americans about a significant period of the nation’s history that, for whatever reason, is left out of textbooks? Yes, I think the story of the Comstock Lode crystallizes so much that was going on in America at the time (the late 19th century): robber barons looting the country, while at the same time certain inventions and developments—the cable that will make elevators safe and permit the building of skyscrapers, modular cubes as a construction form that will allow those buildings to really scrape the sky—were being developed in what amounted to a kind of industrial lab. At the Comstock and in San Francisco, where the mining stock market was headquartered, you can see fraud galore as well as the evolution of a new kind of American writing in the newspapers springing up in the mining towns. As I claim in my introduction, New York and Chicago would have denied it, but for about 20 years, from 1860-80, this remote place in Nevada was just about the most exciting place in the United States. In 245 pages, you explore the myths of frontier America and the Wild West—with its familiar cast of characters (familiar by way of movies and television shows, westerns, etc.). Yet the story’s both highly enjoyable to read and, at times, quite funny. There’s a great deal of material here, and I imagine much more that didn’t make the final cut. How did you go about arranging your source material? How did you determine the arrangement, say, of your 9 chapters? Most of it just came instinctively. For me, at least, there comes a point when I’ve so steeped myself in my material that it sort of arranges itself. In this case, the material seemed to fall into three big sections, which also followed a rough chronological order: the first four chapters, which get the Comstock ore discovered and the town of Virginia City, Nevada, up and running; the middle chapters centered on the wheeling and dealing of two groups that hogged most of the profits, the Bank of California crowd and the Bonanza Kings; and the last couple of chapters, which focus on Mark Twain and Big Bill Stewart. But I did have some leftover material—some leftover characters, really—and I made a conscious decision to tell the stories of Conrad Wiegand, Sutro, and John Percival Jones in a chapter called “Challengers.” The Comstock was very tribal, but these were individualists who bucked the system in one way or another, and it seemed to make sense to group them. At one point, you describe how mine owners in the Comstock would “cook” dividends so that stocks were pumped up artificially and then sold to speculators at higher rates. Reading this passage, I was reminded of a recent article by Matt Taibbi in Rolling Stone. “Class” certainly plays a role in your book. How would you say Mile-High Fever speaks to readers today? To the times we live in? There were essentially two classes in Comstock transactions: mine owners and stockbrokers, on the one hand, and everyone else. There was an incredible asymmetry of information between the two. The owners and stockbrokers could anticipate the movements of the stock market and influence them by their decisions, and the public simply had to gamble. I include an anecdote about a stockbroker taking a friend for a walk along the San Francisco waterfront circa 1890. The broker keeps pointing to yachts that belong to this or that stockbroker. At one point, his friend asks, “Where are the clients’ yachts?” And, of course, there aren’t any. That sounds a bit like the fiscal machinations of our own times, doesn’t it? 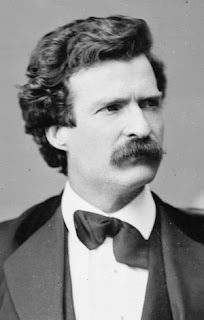 Alternate-world speculations are always tricky, but I do wonder what Twain’s career would have been like if he hadn’t moved to Virginia City, begun imitating the kind of tall tale that his fellow journalists were writing to fill the pages of The Territorial Enterprise on slow news days, and immersed himself in the multi-ethnic slang spoken in the streets and saloons. It’s hard to imagine Huck Finn written in the style of Henry James, but something along those lines might have happened if Twain had gone straight to the East Coast instead of living in Nevada for a year and a half. The shenanigans of the Bank Ring, The Bonanza Kings, and others—including, especially, William Sharon and Senator William Stewart—add a wonderful degree of drama (and, to me, comedy) to the story of the Comstock. You name several books during the course of yours—Trollope’s The Way We Live Now, for example, or Walter van Tilburg Clark’s The Track of the Cat—and that makes me wonder: Where do interested readers go to get their hands on more amazing stories of the Wild West (if their tastes don’t run the way of Zane Grey)? I would recommend A.B. Guthrie’s The Big Sky, Robert Lewis Taylor’s The Travels of Jaimie McPheeters, John Williams’s Butcher’s Crossing, and E.L. Doctorow’s Welcome to Hard Times, though I can’t say that any of them is very funny. But I think they give a pretty realistic, non-Zane sense of what the old West was really like. But I can’t think of any fiction that captures the wildness of the old West as well as some of the best nonfiction accounts do. Maybe that’s because the real wildness lay not in gunslinging and epic poker games, as we tend to see in the movies, but in financial fraud and heroic underground tunneling and other maneuvers that don’t lend themselves to readymade drama but can be great fun to read about just the same. Look for another interview with Dennis Drabelle next week over at Art & Literature. Because I'm traveling from western New York today--after a mighty fine weekend of sun, cool weather, and family talk--and have neither the time nor the energy to write a new post, I'm going to repost this oldie but goodie from December 15th of last year. Look for an interview with Washington Post Book World's contributing editor Dennis Drabelle tomorrow. This may be the world's most obvious post. But this needs to be said. If you don't want to hear this again, stop reading right now. When you write fiction (or for that matter prose) of ANY kind--YA, "literary," erotica, mystery, thriller, you name it--then readers need to use their 5 senses to get the full picture. I remember reading a piece by Lewis Nordan, and in it he wrote that he goes through each page and makes note of all the places he could add sensuous detail. I remember thinking how much sense his idea made: literally going through your pages just looking for ways to enrich it through the senses. In my opinion, it's the sensuous matter that elevates good writing to great writing. Danny met with Ralph Raphelson at the headquarters of the Boston Central Labor Union on the first Thursday in August. Raphelson was so tall he was one of the rare men with a face Danny had to look up into as he shook his hand. Thin as a fingernail, with wispy blond hair racing to depart the steep slope of his skull, he motioned Danny to a chair and took his own behind the desk. Beyond the windows, a hot-soup rain fell from beige clouds and the streets smelled like stewed produce. Notice how easily this scene provides information that feeds our senses. We get a sense of how tall this Raphelson is in relation to Danny (sight); we get a sense how this man looks; we get a sense of the smell ("like stewed produce"); and we even get a sense of what the rain outside feels like: it's a "hot-soup rain." This is pretty vivid stuff, and it sets up the scene to come really quite well. How great is that? Three senses touched in, what, 60 or 70 words? Whenever I read a manuscript, I look for this stuff. Word of warning to anyone who ever gives me anything to read! Now, you don't have to cover all five senses on every page--the uses should always seem organic and not additions for the sake of it--but if you can make your words leap out at the reader and seem true to the experiences YOU certainly feel and see and smell and taste and hear when walking down the street, then you're on to something. Remember this: This is the writer's one real chance to make poetry out of his art, to describe the world surrounding her or him in new ways that make the reader say that's it, yes, that's exactly it. 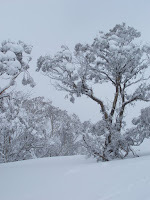 Try imaging how you'd describe being IN the snowy cold image at the beginning of this post. Those of you who, like me, grew up with lots of snow know exactly what this experience is like. But it's hard to describe it, to get it right for others. Yet that's exactly what motivates me to try. Just a brief post today. I wanted to share the great news that a certain Writer's Center workshop leader--Robert Bausch--is the recipient of the 2009 Dos Passos Prize. Recipients of the prize are American creative writers who have produced a substantial body of significant publication that displays characteristics of Dos Passos's writing: an intense and original exploration of specifically American themes, an innovative approach to form, and an interest in a wide range of human experiences. The jury unanimously agreed that as a writer, [Robert Bausch] embodies these criteria, amazing us all with the fictive range of [his] body of work. One juror wrote: "Bausch has the wayfaring kind of imagination that leads him not only to strikingly different stories and characters, but also to differently imagined ways of telling each different story. It is hard to believe the same writer gave us the darkly compelling and wildly inventive The Lives of Riley Chance who gave us the absurdly comic and risky Almighty Me." Past winners of the prize include Graham Greene, (before it was exclusively for American writers), Tom Wolfe, Paule Marshal, Elizabeth Spencer, James Welch, Lee Smith, Ernest Gaines, Jill McCorkle, Madison Smartt Bell, and Richard Powers, among others. Take a look at his Web site right here. This has been a busy week in preparation for the 4th of July holiday and my upcoming trip to Denmark. Today I'll simply post our just-posted events calendar for September. The complete listing you can find at our Web site here. Mark your calendars! The Writer’s Center and the Town of Leesburg present “Getting Personal: Tips on Writing the Personal Essay and How to Market It” with Anne Cassidy. Visit her website at www.annecassidy.com. Location: The Leesburg Town Hall, 25 West Market Street, Leesburg, VA. Admission $6 ($4 for Writer’s Center members and residents of Leesburg). 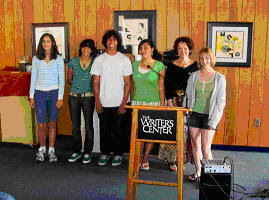 Meet Writer’s Center workshop leaders, staff, and board members at our Open House. You’ll have an opportunity to meet individually with workshop leaders. We will post additional details on the program in our Web site and blog. Elizabeth Rees reads from Now That We’re Here. She is joined by Jamie Brown, author of Conventional Heresies, and Neva Herrington, author of Her BMW and Other Poems. Join Michael Montlack, the editor of My Diva: 65 Gay Men and The Women Who Inspire Them, as he and selected authors published in this anthology read their essays. At the Writer’s Center event, readers will be David Bergman on Lotta Lenya; RJ Gibson on Annie Lennox; John Dimes on Bjork; Allen Smith on Jessica Lange; Bill Fogle on Julia Child; and Michael Montlack on Stevie Nicks. Poetry and Prose Open Mic. Sign-up begins at 1:30 P.M.